Who was Thomas Alva Edison? He was an american inventor, great scientist, and successful businessman who developed several devices that greatly influenced the life of many people around the world. Edison is considered one of the most prolific inventors in history, having produced over 1,000 US patents in his name and many more around the world. Edison created the concept and made possible the electric-power generation and the distribution to homes, businesses, and factories – a necessary development in the modern industrialized world. The following is a report of Edison throughout the years right after he invented the Phonograph or what was also called the gramophone, while other inventors had produced devices that could record sounds, Edison’s phonograph was the first to be able to reproduce the recorded sound. 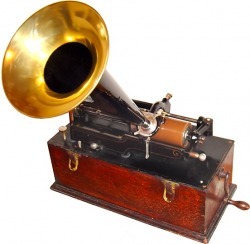 The Phonograph was a device introduced in 1877 for the recording and reproduction of sound recording. The recordings on the phonograph played on such a device consist of some type of waveforms that are engraved onto a rotating cylinder or disc. As this cylinder or disc rotates, a stylus or needle traces the waveforms and vibrates to reproduce the recorded sound waves. His phonograph originally recorded sound onto a tinfoil sheet phonograph cylinder, and could both record and reproduce sounds. 1877, The first device for recording and playing back sound. Patents the Phonograph. Concentrates on Electic Lighting. Therefore, doesn’t have any role in the development of the Phonograph for nearly a decade. 1887, Edison Labs turned their attention back to improving the phonograph and the phonograph cylinder. 1888, Edison company debuted the Perfected Phonograph and 2 minute wax cylinders The original term for a phonograph as a “talking machine”, was for recording dictation used by stenographers. The dictation machine eventually evolved into a separate device called the “Ediphone”. 1908, A new line of cylinders called “Amberols”, 4 minutes of music. New machines were sold to play these records, as were attachments for modifying existing 2 minute Edison phonographs. 1912, The Edison Diamond Disc Record was introduced. Diamond Discs were superior in sound but were also more expensive. This together with the incompatibility of the Edison system with other discs and machines had an adverse effect on Edison’s market share. 1928, Edison company began plans for making “needle cut” records but they sold poorly as Edison’s market share had declined to the point where it was no longer one of the leading companies compared to leaders like Victor, Columbia, and Brunswick. Edison Records closed down in 1929. The record plant and many of the employees were transferred to manufacturing radios. The masters for the Edison Records back catalogue were purchased by Henry Ford, and became part of the collection of the Henry Ford Museum.